I don't know about you - but I look forward to the first apples and pears of the season with the same kind of excited anticipation usually reserved for the first June strawberries. Pears and apples are extraordinarily diverse fruits that can be used in both sweet and savory recipes. PEARS - when slowly roasted with olive oil and flaky sea salt, sweet, fragrant pears, with their tiny pebble texture become the perfect accompaniment to soft cheese, rough pates, on sandwiches and as a Parmesan risotto topping. Use 4 - 6 pears, or more - as long as you've got the oven on make enough to last awhile. But then again - they're such good little snacks that they disappear at alarming speed. Preheat an oven to 325 degrees F. Don't peel the pears - do quarter and core them, slice each quarter vertically into as many 1/4-inch slices as possible. Place them on a cookie sheet with sides or jelly roll pan and rub them with a fruity olive olive. Roast, turning occasionally until they're crispy on the outside and still a bit soft on the inside - about 1 - 1 1/2 hours. Some slices will be completely crispy and therefore delicious! I usually use Bosc pars for roasting. They're hard and stand up to slow roasting. However, use Bartlett, Comice or d'Anjou if you wish - just make sure they're still quite hard - not completely ripe. APPLES - The first thing I make with the new of crop of apples is Caramelized Applesauce. I continue to make it all winter. I usually use tart apples such as greenings or Granny Smiths - but this fall I'm quite taken with Northern Spys. In a large heavy-bottomed sauce melt 4 tablespoons butter with 1/2 cup sugar. Stir continuously until the mixture turns medium amber, then immediately add 4 pounds of peeled, cored and thinly sliced or cut into chunks apples. The caramel will initially hardened; lower the heat and keep stirring, and it will dissolve into the apples. Cook the apples for 15 minutes or so. Much depends on how you like your applesauce, chunky or smooth. Remove from heat and reserve. I like this applesauce served in a puddle of heavy cream or, with plain yogurt and granola or, on brioche or challah French toast or, as a layer in bread pudding, and on and on. 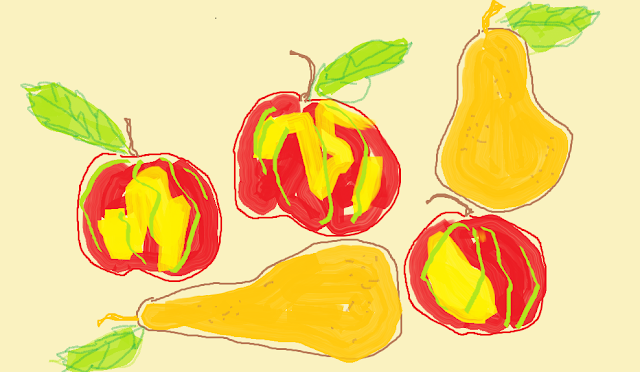 PEARS and APPLES - here's a recipe from my book. "Contorni: Authentic Italian Side Dishes for All Seasons" (Chronicle Books, 2003). In Italian it's called un contorno suo malgrado - a side dish in spite of itself. I usually bring it out, in its baking dish, with a selection of cheese either with the main course or for dessert. 1. Preheat an oven to 375 degrees F. Dig out a little hole int he blossom end of 2 apples and 2 pears. Put a sugar cube in each opening. Place all the apple and pears in an attractive terra-cotta or ceramic baking dish. Pour the wine over the fruit. 2. Bake, spooning the wine over the fruits every 30 minutes, until the fruits appear soft, but not mushy, and are slightly charred, about 2 hours. Serve warm - not hot - or at room temperature. SUSANSIMONSAYS: My new favorite use of apples is in a savory, sweet and spicy dish called "Hot Lightening" served at the New York City restaurant, Van Daag. The starring ingredient in this dish are roasted-to-a-crisp fingerling potatoes garnished with bits of crunchy bacon, chopped apples, stroop syrup and a shower of cayenne pepper. Your blog is great Susan! You are an amazing writer and I salivate nonstop when I read it. Congrats!